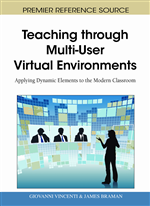 This chapter focuses specifically on the use of three-dimensional multi-user virtual environments (3D MUVEs) for simulation-based teaching and learning in tertiary-level healthcare education. It draws on a broad range of extant research conducted over the past three decades, synthesizing this with newer developments and examples that have emerged since the advent and proliferation of the “3D Web.” The chapter adopts and advocates a research-informed approach to surveying and examining current initiatives and future directions, backed by relevant literature in the areas of online learning, constructivist learning theory, and simulations. Both opportunities and challenges are discussed, with the aim of making a contribution to the development of best practice in the field. Three-dimensional multi-user virtual environments (3D MUVEs), including virtual worlds such as Second Life and Active Worlds, as well as popular massively multiplayer online games (MMOGs) such as World of Warcraft, Runescape, and The Sims Online, are receiving significant attention and interest from tertiary educators as a means for providing their students with engaging, immersive, multi-modal online learning experiences. These environments hold great potential for enriching higher education teaching and learning by presenting opportunities to bridge the divide between students’ experiences with technology in formal education settings and those that occur in other aspects of their lives (Prensky, 2001b, 2001c, 2006; Wolburg & Pokrywczynski, 2001; de Freitas, 2008). Excited at the possibilities, universities and colleges across the globe are building models of their campuses in virtual worlds using a variety of platforms, and using them to deliver in-world lectures, tutorials, seminars, and collaborative exercises. Such initiatives are also allowing education institutions to reach new audiences, extending learning beyond the conventional boundaries that have been long in use. Indeed the tyranny of distance faced by many students, either due to campus disparity, living conditions, or time, provides a compelling argument for the use of 3D MUVEs as a means of fostering a learners’ sense of presence, which is widely acknowledged as a key constituent of effective online learning (Bronack, Riedl, & Tashner, 2005). In addition to replicating on-campus or classroom-based teaching activities, 3D MUVE technology can be used as a basis for simulations, to deliver authentic learning experiences that are difficult, impractical, or impossible to achieve in the real world (Saunders, 2007). Frequently described as “non-linear exploratory environments” (Aldrich, 2004, 2005), simulations have been used as part of computer-assisted learning (CAL) materials for at least three decades, with “SimCity” being one of the earliest and most popular examples. Until recently, however, the prohibitive costs of equipment and computational power required to enable high-fidelity 3D simulations confined them to specialized laboratory environments and medical and military training facilities. In the last decade, the ubiquity of the multimedia-capable, broadband-connected personal computer has led to a resurgence of interest in web-based virtual reality (VR). The new wave of multi-user online games and virtual worlds is increasingly being seen as offering viable alternatives to visiting a real place or performing a real activity. 3D MUVE-based simulations can allow the learner to develop, practice, and refine vocational, professional, and other skills in a real-time, collaborative virtual environment that is safe and cost effective, yet reflects and incorporates much of the dynamic complexity of the real world. This chapter commences with a critical exploration of the motivation and rationale for using 3D MUVE-based simulations in higher education teaching and learning, with a specific emphasis on the healthcare domain, based on a systematic review of the literature. Theoretical and pedagogical models and frameworks that underlie current and proposed uses of 3D MUVE-based simulations in healthcare education are surveyed, before reporting on current initiatives that represent the major issues surrounding research and practice in this area. The aim is to distill and illuminate the key developments/milestones and challenges in order to provide an overall “snapshot” of the field, to help guide and inform scholars and professionals. The chapter concludes with a discussion of the future of 3D MUVE-based simulations in healthcare education, including some of the challenges and opportunities for both researchers and practitioners.